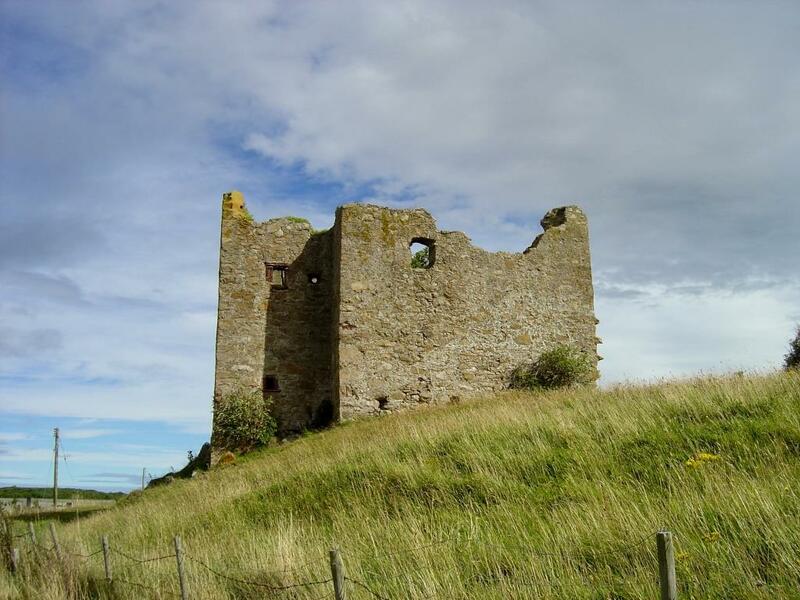 Findochty Castle can easily be seen from the A942 between Buckie and Portknockie on the Moray coast. The tower occupied a spit of high ground in the centre of a large bowl of farmland, which once formed a shallow loch. To the south is the higher ground of the Moor of Findochty, and to the north the land rises slightly to the golf course, in the middle of which is the old Law Hillock of Findochty. The site is defensive, but not in a strategically important location. The castle consists of a rectangular building with a projecting section on the end of the north gable containing the staircase. In addition there are the ruins of a roughly square building with a separate doorway which extended to the east, and the footings of a courtyard wall following an irregular shape to enclose the island. Immediately to the south is a derelict cottage which used part of the courtyard wall as its eastern side. The western side of the castle is surprisingly intact and in good condition; there is a small window on the second floor, and small openings to the basement. The stair wing is provided with tiny openings to the north at basement and second floor level, and a small window serving the ground and second floor to the west; a further tiny window faces east. There is evidence that the gable of this was crowstepped at one time. The southern gable of the block has been altered; there are tusks of masonry projecting on the western side, and what is assumed to be a doorway is provided with a main lintel, and a second one higher up. In the 19th century, the castle formed the cenrtal block of a much larger building know as the Mains of Findochty. To the east, the ruined wall extending from the tower actually formed the north wall of a long L-shaped building; only part of this survives to be visible from aerial photos shown on the Canmore database. The western wall of the castle today formed an internal wall; domestic buildings roughly two thirds the width of this wall continued to the west, and then another building extended still further to the east. To give an indication of the size, Findochty Castle today measures roughly 10 metres from north to south and about 5 metres east to west. The old Mains extended a total of 50 metres from east to west; roughly twice as far west as the ruined wall you can see from the road, and a similar distance to the west. When this was all demolished sometime in the late 19th century, the old castle walls needed to be repaired, and it was at this point Findochty Castle took up its current appearance. Despite descriptions usually stating it was an L-plan tower house, so much of the castle has been altered that it is impossible to draw any real conclusions about its original layout. The vaulted basement behind the southern doorway contains a fireplace in the western wall, and apparently the staircase served all floors; the walls are about 0.85m thick, indicating a later date than is assumed to have been the build date. The history of Findochty is fragmentary to say the least. The earliest reference to the lands of Findochty is in 1440, when the lands of Findochtyfield were granted to John Duff, son of John Duff, by King James II. It is very likely this was John Duff of Muldavit and Craighead, but questionable as to whether the lands of Findochty and Findochtyfield are one and the same, since the lands of Findochty were granted separately by the baillies of the Burgh of Cullen to Alexander Ogilvie of that Ilk in 1521; and at this date the name Findochty was used interchangeably with Bryntoun. In 1547 Agnes Gordon and her husband John Ogilvie alias Gordon issued a bond of reversion of the lands of Bruntown, “otherwise called Findochty”. In the same year the Parson of Rathven issued a tack (lease) of the lands of Findochty to John Hay; the Queen then took possession of the tack on the basis Hay had failed to support her against the rebel Gordons in 1556. Later the same year Queen Mary gave the tack to James Ogilvie of Cardell. The lands of Findochty and others were then given up to James Ogilvie of that Ilk by Marion Ogilvie since James had redeemed a wadset held on the lands. In 1586, James Ogilvie issued a charter to Thomas Ord in Keithmill, in which the lands of “Findochty with the manor place, port, and customs within the same” are granted to him. It is clear that the manor place refers to the castle – and equally clear that it was not perceived to be a castle at the time, since the terms fortalice and tower are not used, which we would expect to be the case. There is similarly no evidence of a castle or tower at Findochty on Pont’s map a few years later. We might instead expect to see a vaulted stone hall with an associated courtyard, perhaps even of two storeys with an attic – but no tower. Thomas Ord resigned the lands to his son Alexander in 1586, and Alexander succeeded his father in 1616. Alexander was followed by William, his son, who resigned the lands of Findochty to his uncle James Hay of Muldavit in his minority before claiming them back in 1647. William was followed by Alexander, William, and John, who sold his lands to the Earl of Findlater in 1724. By 1794 the place was in ruins. Today Findochty Castle is fenced off and is unsafe, but it is possible to walk down the track to get a closer look at the western face of the building.